Hello, and welcome to the very first post of Ankh = Life, a blog about Shamans. "But...who the hell are you and why do you want to write a blog?" The first part is easy: Call me Nim. I am not, in fact, a female, and when people call me Nimala, it makes me feel...pretty.......Anyway, Nim. It's much more....well, not-girly. The second part of that question is a bit more complicated. It started when I first specced into Restoration. I was clueless. Now, I've been away from the blogging community for a while, but I know that some of the best advice comes from the great ideas and tips people share via blogs. It was an obvious choice for me. I popped "Resto Shaman + Blog" into my Google search and....wait...did I misspell something? No, no, everything's spelled right. 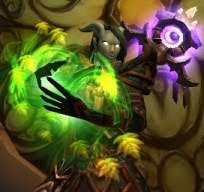 Why are there so few blogs about Resto Shamans? I didn't think too much about it at the time and decided to jump over to the Elitist Jerks Forum, whereupon my brain immediately exploded in a fit of numbers and statistics. Fast forwarding to present day: I just dualled back into Enhancement. I need to learn some macros if my 4 spell-fingers want to be at all effective in this spec. One of the first sites that popped up was Shields Up! ; more specifically, drug's Basic Shaman Macros post. While it gave me some good tips about macros in my resto spec, that's not what I was looking for. But I was intrigued by his blog, as I am wont to do about just about anything WoW. So I began perusing through some of his posts, and I saw in particular one post that gave me a flashback of my first days as a resto shaman. The very first sentence was "...there aren’t really a lot of resto shaman blogs out there." It made me sad to have found so few blogs about them, and I don't want potential future Resto Shamans to be as sad as I was. I'm a good guy, I really am. It totally had nothing to do with the fact that I needed something to get me to start writing again and what's better to write about than something you love? Altruism is my anti-drug. Yep. Anyway, I hope that answered your question. 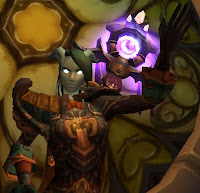 In my next post, I will likely be going over my feelings on the 3.3 changes to Shamans (and changes in general) since my Blizzard downloader just finished up. Icecrown, here I come! Hey Nim, I can't find you feedreader icon... I want to read the feed! And I want you to read the feed! I just don't know how it works. >_> Apologies for the inconvenience and my ignorance. Hopefully I'll get it figured out soon and I'll have it up. Keep an eye out! All good.. got it.. thanks!